Oran Kearney got life at St Mirren off to a positive start. St Mirren manager Oran Kearney (left) and Ryan Edwards gesture to supporters. 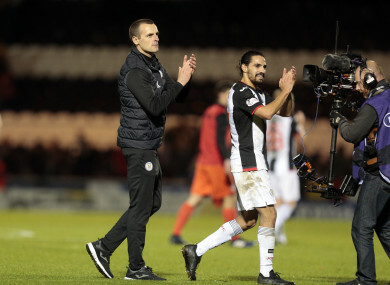 ORAN KEARNEY’S FIRST match as St Mirren manager ended in a promising goalless draw at home to 10-man Celtic on Friday. Former Coleraine boss Kearney was appointed earlier this month and has been told his job as a PE teacher in Antrim is still there for him if life in the Scottish top flight doesn’t work out. The Scottish Premiership champions found themselves a man down when midfielder Olivier Ntcham was sent off in the 36th minute for collecting the second of two yellow cards. Former West Ham and Sunderland defender Anton Ferdinand, 33, made his St Mirren debut hours after signing until the end of the season, while Ryan Edwards made his first appearance for the Paisley side after joining on loan from Edinburgh club Hearts. St Mirren made a bright start and in the third minute, following a Ntcham handball, Cammy Smith fired in a free-kick but Hoops goalkeeper Craig Gordon moved quickly to his right before punching the ball clear. Saints went close again in the 13th minute when midfielder Ryan Flynn headed a cross from Lee Hodson over the bar from 12 yards, before Gordon blocked a close-range effort from Smith. Celtic found themselves down to 10 men when Ntcham, booked for an earlier foul on Edwards was shown a second yellow card by referee Andrew Dallas for an overly aggressive challenge wild on St Mirren captain Stephen McGinn on the touchline. Celtic manager Brendan Rodgers reshuffled his line-up and while the Hoops remained solid they offered little attacking threat until the former Liverpool boss brought on Leigh Griffiths in place of Filip Benkovic early in the second half. But Celtic midfielder Callum McGregor’s shot was saved easily by Buddies keeper Craig Samson, who then saved a chip shot from James Forrest. Griffiths put the ball in the net right at the end of the match but the flag was up for offside. Email “Celtic held in Antrim PE teacher's first match in charge”. Feedback on “Celtic held in Antrim PE teacher's first match in charge”.